DIE Martis, 23 die Octobris. Bill to prevent Frauds in receiving the King's Monies. Report of the Conference concerning the Vote against importing French Commodities. Hodie 3a vice lecta est Billa, "An Act for Encouragement of sowing and planting of Hemp and Flax." To deliver to them the Bill concerning the Encouragement of sowing and planting Hemp and Flax; and to desire their Concurrence thereunto. Hodie 1a vice lecta est Billa, An Act to enlarge the Time given by former Act, for the Redemption of Mortgages made by the Earl of Cleveland." Hodie 1a vice lecta est Billa, "An Act for preventing Concealments, and all other Frauds and Deceits, in those Persons that are accountable to His Majesty for the Receipt of Monies." The same Lords that managed the last Conference are to report this Conference with the House of Commons. The House was adjourned during Pleasure, and the Lords went to the Conference with the House of Commons; which being ended, the House was resumed. "That Mr. Solicitor, at this Conference, gave Satisfaction to those Difficulties propounded by their Lordships at the last Conference." "He said, That their Lordships being satisfied concerning the Matter of the Business, saves them a Labour of speaking to it." "Concerning their Lordships First Proposition, That His Majesty's Customs may be impaired thereby, the Commons say, They desire their Lordships to consider, that in all Ages, in Time of War, there hath been the same Kind of Prohibitions, grounded from Magna Charta, Cap. 30; and in other Kings Times the like was done, as 27 H. VI. I. 28 H. VI. I. 4 E. IV. 6. By some of which Laws it appears, that when the Duke of Burgundy had prohibited our English Cloth, the Kings of England prohibited the importing of Commodities from his Jurisdictions." "The Commons say, Herein they build on the Wisdom of their Ancestors, in making such Prohibitions in such Times, whereby the Crown suffered in the Profits, as now; yet the Loss of it was not put in Balance with the Disadvantage it brought to the Enemies." "But to come lower; as to the Proclamation made by the King, the 15th of March 1664, by which Dutch Commodities were prohibited, though His Majesty had Loss thereby, yet He never balanced the Dignity of the Crown to a little Profit; and the Commons say, there is the same Parity of Reason for this, of prohibiting French Commodities, unless that the Rigour against the Dutch be greater than that against the French. They say further, That the King's Revenue will be more diminished by French Trade, if they be permitted to carry out the Money and Wealth of this Kingdom." "They look upon this Diminution of the King's Revenue very tenderly, as their own Loss; and the King hath great Assurance that they will never desert Him in the carrying on of the present War, but will supply Him with their Lives and Fortunes." 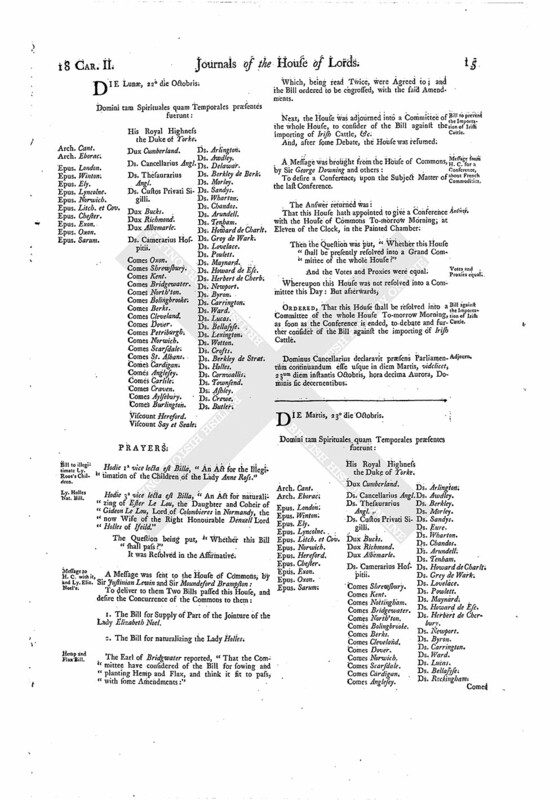 "As concerning the Loss of the Duke of Yorke's Revenue by Wine Licenses, the Commons say, That the Law as it stands hath brought this Loss on him, as the Act of Navigation, for by that Act no English Ship, much less no French, can bring in such Commodities; nothing but Dispensation can relieve him, which is besides the Law. They believe his Royal Highness will not repine, though he find his Revenue to depend upon Accidents of Peace and War, as others do. And His Majesty will take Care of him, as we answer His Majesty's Occasions. "As concerning the Proposition which their Lordships have given, That Care may be taken that French Wines may not be brought in under colour of Rhenish Wine; the Commons say, That they do see an apparent Possibility of Fraud if they come in, and further diminishing of our Revenues; but it is better to hazard that, than to beget new Differences with the Princes of Germany and the King of Spaine, out of whose Territories those Wines come, because we have Enemies enough already. 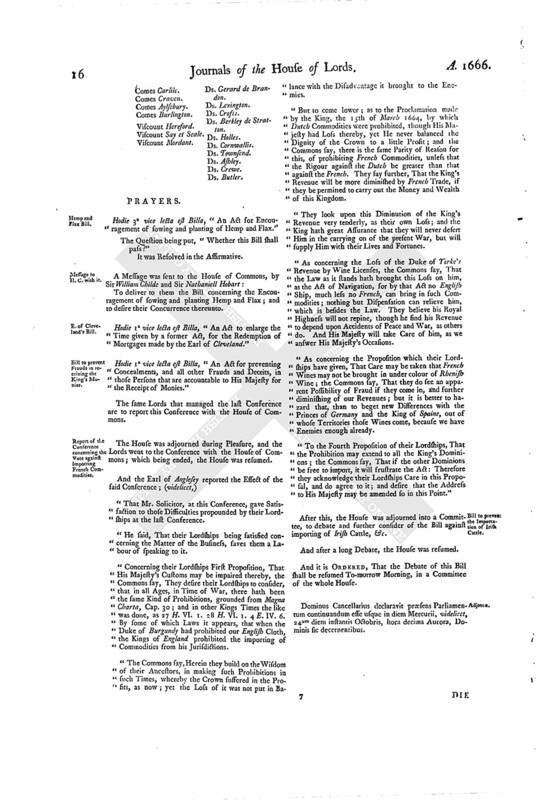 "To the Fourth Proposition of their Lordships, That the Prohibition may extend to all the King's Dominions; the Commons say, That if the other Dominions be free to import, it will frustrate the Act: Therefore they acknowledge their Lordships Care in this Proposal, and do agree to it; and desire that the Address to His Majesty may be amended so in this Point." After this, the House was adjourned into a Committee, to debate and further consider of the Bill against importing of Irish Cattle, &c.
And after a long Debate, the House was resumed. And it is ORDERED, That the Debate of this Bill shall be resumed To-morrow Morning, in a Committee of the whole House. Dominus Cancellarius declaravit præsens Parliamentum continuandum esse usque in diem Mercurii, videlicet, 24um diem instantis Octobris, hora decima Aurora, Dominis sic decernentibus.